In certain diseases, however, such as multiple sclerosis, the barrier can be improperly breached. These “leaks” can allow immune cells and inflammatory molecules to pass through, causing inflammation that leads to neuronal damage. 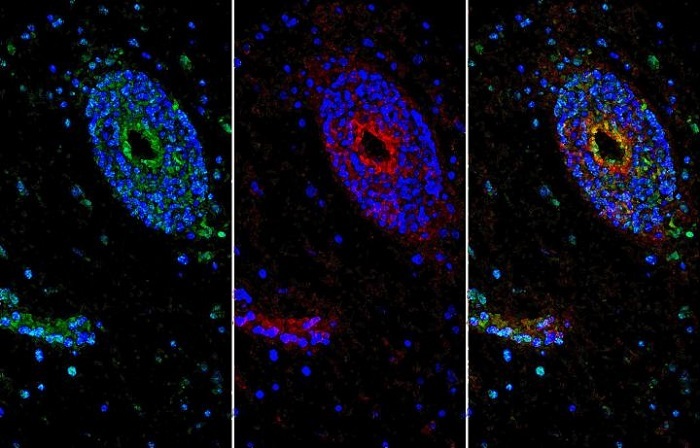 In a new study, researchers have made insights into how the blood-brain barrier, or BBB, is maintained, identifying a protein key to the process. Delivering this protein to mice with the rodent equivalent of MS improved their symptoms. The research, led by the University of Pennsylvania’s Jorge Ivan Alvarez and Cornelia Podjaski of McGill University and Alexandre Prat of the University of Montreal, will appear in the journal Brain. Alvarez is an assistant professor in Penn’s School of Veterinary Medicine. He conducted the study with Podjaski colleagues from McGill University and the University of Montreal, where he completed a postdoctoral fellowship under the direction of Prat. Prat is a full professor at the University of Montreal’s Faculty of Medicine and directs the Neuroimmunology Laboratory at the Centre hospitalier de l’Université de Montréal Research Centre. Podjaski is currently a researcher with New Nordic Inc. In 2011, Alvarez and Prat published a study in Science that identified that the protein sonic hedgehog, or Shh, is secreted by central nervous system cells called astrocytes and plays a key role in blood-brain barrier maintenance, in part by preventing immune cells from entering the brain. But the researchers still didn’t have a complete picture of the signaling events downstream of Shh that mediated this effect. To find out more, they first used human cells in culture from the blood brain barrier, called endothelial cells. They found that applying Shh to the cells caused levels of a protein called netrin-1 to rise. In mice bred to lack the molecular receptor for Shh, netrin-1 expression was reduced, indicating that netrin-1 expression depends on Shh. Curious as to whether this might influence MS, they examined BBB cells from the brains of people who had died from the disease. Normal tissue from these individuals contained low levels of netrin-1, while the diseased lesions in the brain had higher levels. The researchers found similar results in a mouse model of MS called experimental autoimmune encephalomyelitis, or EAE. Next, the team directly measured netrin-1’s effect on BBB permeability by labeling tracer molecules and found that netrin-1 significantly reduced the movement of molecules across cultures of human BBB endothelial cells. Further experiments showed that netrin regulates this process by promoting the expression of the so-called “tight junction” proteins, which are located between BBB endothelial cells and are responsible for controlling barrier function. The team also found that, when in an environment rife with inflammatory signaling molecules, which would normally compromise the integrity of the BBB, netrin-1 had a counteracting effect, preventing disruption to the BBB.“In mice bred to lack netrin-1, we observed that proteins normally found in the blood accumulated in the animals’ brain, another sign that netrin-1 ensured the integrity of the BBB,” Podjaski explains. Armed with these findings suggesting netrin-1 protects the BBB, the team tested the potential of netrin-1 in ameliorating EAE symptoms, which are similar to those of people with MS. “By administering netrin-1 to mice before the EAE disease was induced, we found that animals had less severe disease, delayed disease onset, fewer lesions in their brain, fewer markers of inflammation and better maintenance of body weight compared to mice given a sham treatment,” Podjaski says. Moving forward, the researchers hope to further elucidate the pathway through which Shh and netrin-1 operate, with an aim toward finding more effective ways to uphold the barrier — and perhaps one day treat diseases like MS.
Additional researchers on the study were the University of Montreal’s Lyne Bourbonniere, Sandra Larouche, Simon Terouz, Marc-Andre Lecuyer, Olivia Saint-Laurent, Catherine Larochelle, Nathalie Arbour and McGill University’s Jenea Bin, Peter Darlington, Jack P. Antel and Timothy E. Kennedy. The research was supported by the Canadian Institutes of Health Research and the Multiple Sclerosis Society of Canada. Prat holds the Canada Research Chair in Multiple Sclerosis. The University of Montreal is officially known as Université de Montréal.